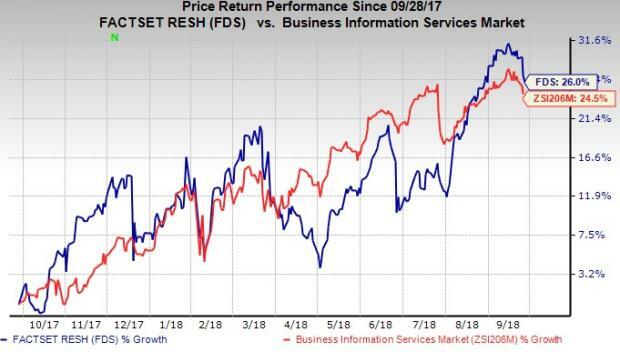 FactSet Research Systems Inc. FDS reported dismal fourth-quarter fiscal 2018, with earnings and revenues missing the Zacks Consensus Estimate. Adjusted earnings per share (EPS) of $2.20 lagged the consensus mark by 2 cents. However, the bottom line improved 15.8% on a year-over-year basis. The upside can be attributed to the tax reform policy (U.S. Tax Cuts and Jobs Act). Notably, the effective tax rate was 18% in the reported quarter compared with 25.3% in the prior-year quarter. We observe that shares of FactSet have gained 26% in a year’s time, outperforming the industry’s rally of 24.5%. Revenues of $345.9 million missed the consensus mark by a slight margin and increased 5.9% year over year. Organic revenues improved 5.3% to $347.1 million. The improvement was primarily driven by accelerated sales of wealth management solutions, content and technology solutions (CTS) as well as research and analytics products. Region-wise, U.S. revenues climbed 5% and international revenues improved 6% on an organic basis. The improvement can be attributed to increased sales in all business segments. FactSet’s Annual Subscription Value (ASV) was $1.39 billion at the end of the fiscal fourth quarter, up 5.7% from the year-ago quarter’s figure of $74.4 million. Organically, it increased $38.6 million during the quarter. Buy-side and sell-side ASV growth rates were 5.4% and 7.3%, respectively, in the reported quarter. Of this, nearly 83.9% was generated by buy-side clients and the rest is derived from sell-side firms performing functions like mergers and acquisitions advisory work, capital markets services as well as equity research. ASV generated from the United States was $868.7 million, up 5.3% from the prior-year quarter’s level on a reported basis and organically. Internationally, ASV was $524.4 million, up 6.7% year over year on a reported basis and 6.3% organically. Asia-Pac region delivered growth of 11% and Europe grew at a rate of 5%. FactSet added 167 clients in the reported quarter, taking the total number of clients to 5142. New client additions were driven by institutional asset managers and strength in wealth management business. The company retained 91% of its clients. The percentage of client retention was more than 95% of ASV. At the end of the quarter, total employee count was 9,571, up 5.5% year over year. Adjusted operating income came in at $108.68 million, up 5.8% from the year-ago quarter’s tally. Also, adjusted operating margin increased to 10 basis points (bps) to 31.3%, courtesy of constants efforts to improve efficiencies in cost structure. Selling, general and administration expenses increased 6.1% to $88.04 million. Total operating expenses increased 5% to $256.51 million primarily due to increased compensation expenses and legal costs. FactSet exited fourth-quarter fiscal 2018 with cash and cash equivalents of $208.62 million compared with $213.1 million in the last reported quarter. Long-term debt at the end of the quarter was $574.78 million compared with $574.74 million at the end of the last reported quarter. In the quarter, the company generated $106.33 million of cash from operating activities and spent $33.52 million in Capex. Free cash flow was $91.18 million compared with $119.65 million at the end of the last reported quarter. FactSet repurchased 329,478 shares for $67.5 million during the reported quarter. The company still has $241.7 million under its existing share repurchase program. On Aug 10, the company declared quarterly cash dividend of 64 cents per share. The dividend was paid on Sep 18, 2018, to shareholders of record at the close of business on Aug 31, 2018. FactSet provided an impressive fiscal 2019 guidance. The company now anticipates adjusted EPS in the range of $9.45-$9.65. The Zacks Consensus Estimate is pegged at $9.62, within the current guidance. Revenues are expected between $1.41 billion and $1.45 billion (mid-point $1.43 billion). The Zacks Consensus Estimate is currently pegged at $1.43 billion. Investors interested in the broader Business Services Sector are keenly awaiting earnings reports from Automatic Data Processing, Inc. ADP, BG Staffing, Inc. BGSF and Alliance Data Systems Corporation ADS. While Automatic Data Processing will report first-quarter fiscal 2019 on Oct 31, Alliance Data Systems will release third-quarter 2018 results on Oct 18. BG Staffing is expected to announce third-quarter 2018 results on Oct 29.